Note that this is just a DEMO review–meaning that MOST shoes that I review on my site I put many miles on and basically get to use them full-time to review (whether purchased myself or begifted to me for review purposes) but these shoes were just used once during a short period of time. 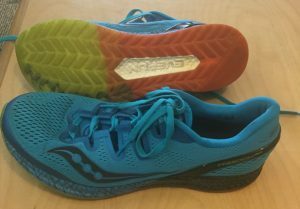 My quick impression of these Saucony Freedom ISO running shoes is that they are a peppy little pair of light racing shoes. They are slimmed down to be light weight and fast. They look sweet but don’t offer a ton of cushion or support. This is just fine to go out and pound a 5k, but I’d be wary to do much longer unless you know your body well enough to put a pounding on it. 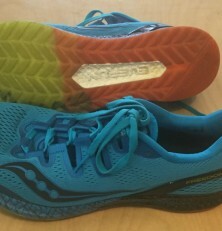 These were definitely fun shoes to wear for a short racing-esque event (a Treadmill Challenge, actually). As mentioned I could see having them as my 5k racing flats, as they felt a lot like my Asics Hyperspeeds that I already use and love for such purposes. I probably wouldn’t train in them, as I generally go for a more traditional, cushioned trainer. They were fun to try and I would consider them if my Hyperspeeds ever went away.